1. I was inspired by this coral and gold nursery at Project Nursery. While I love the Jenny Lind crib, we will be using my nephew's old crib that he has outgrown. My dad is going to paint it white for me. I love the white crib with the peachy pink crib skirt. See #11. 3. Instead of a hamper, I'm planning to make a laundry bag with a pillowcase and embroidery hoop. Lighter than a basket and washable. See #14 for fabric. 5. I like this knitted pouf ottoman from Land of Nod. I am slightly obsessed with knitted poufs. This aqua one will be perfect for the nursery and later on baby girl can use it for a fun spot to play or perch. 6. We have an antique cherry dresser in the guest room/nursery already, and a matching cherry wall shelf. Those will stay. The dresser will be the changing table as well. 7. I want a cute white nightstand to go next to my chair. I'm currently on the hunt for a secondhand version to paint. I love the fun painted pulls on this one by Melissa Esplin. 8. I have selected a lovely variety of pastel printed cottons for my crib bedding. This one is Florals and Paisley in shades of pink, aqua, yellow, and lavender from Joann Fabrics. I'm going to make it a crib sheet. 9. Another crib sheet will be this mint rose print cotton Brambleberry Ridge Rosemilk Metallic Mint by Michael Miller. This one is my favorite! 10. This beautiful butterfly print, Winged Wingspan Melon by Art Gallery will be a third crib sheet. 11. 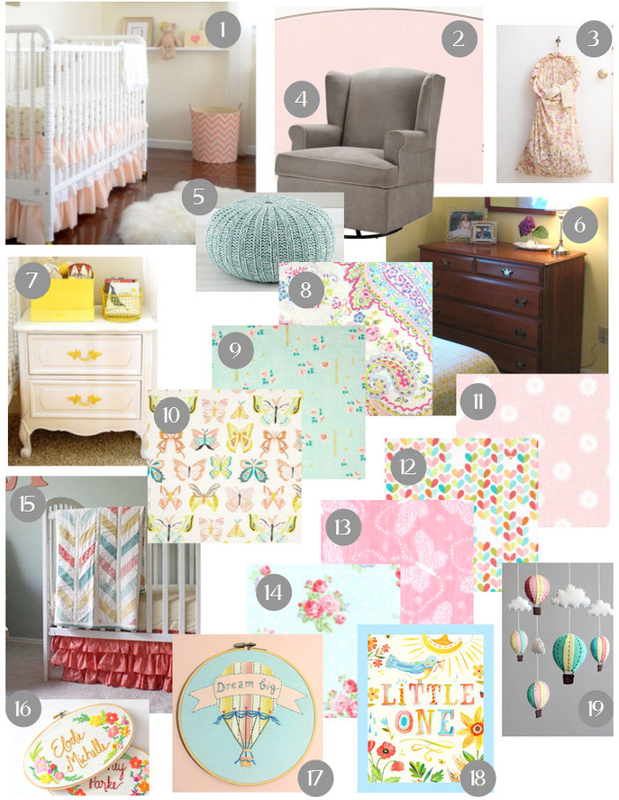 And since I have designed three totally different crib sheets, I want a crib skirt that coordinates with all of them. For that I picked this soft pink quilter's cotton from Joann with little white flowers. So sweet. I'm also going to make a scalloped teething guard for the crib rail from this fabric to coordinate. Like this one. I like this instead of bumper pads to introduce another fabric in the crib. 12. This adorable Michael Miller print, Birds & the Bees Love Bug Coral is for a changing pad cover. It's so cute! Some of the colorful hearts are little ladybugs! 13. I also love this minky butterfly fabric (Flowerly Cuddle Paris Pink) for another changing pad cover (or maybe a blanket?) It's perfect! 14. This fabric is for my laundry bag (#3). It's Bed & Breakfast Floral from Joann Fabrics. 18. I also love this Katie Daisy print for my little one. 19. And last but not least, I want to make this cute felt hot air balloon mobile to hang over the crib. I'm so super excited to start some of these projects. I have all of my fabrics purchased and washed, so I'm all set to start sewing up some baby bedding! Can't wait! For now I'm off to dream of more pink accessories for the pink princess room. Hope you enjoyed my design plan... come back soon to check out my progress!